My Current Music Crush | Life. Realized. In my "free time," which is actually code for "I'm really supposed to be studying or doing laundry," I like to scour the internet for new artists who will rock my world. I prefer to find them early, otherwise Top 40 music stations over play their singles and they quickly lose their luster. 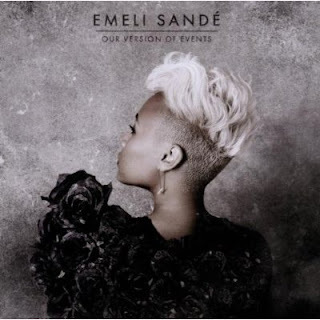 For the past two weeks, my car stereo has been belting out the tunes of Emeli Sande almost nonstop. She's divine, and I want nothing more than to be her BFF. She is so powerful, when I listen to her my whole perspective changes. Her voice is both unique and stunning, and because she favors strong drum beats I don't just feel her music, I really feel it. It's no coincidence that her real first name is Adele. She is of that caliber. Emeli is a Scottish R&B/soul singer-songwriter who has written songs for other artists, but has remained relatively unknown in the States until recently. Everyone should have her album, Our Version of Events, on standby. Even her slower, more melancholy songs make me feel good. Usually there are a few tracks I skip over, but this entire album is pure gold. If I had to pick (don't make me! ), my absolute favorites are: Heaven, Where I Sleep, Wonder, Maybe, and Next to Me. Buy it. Besides, anyone with hair that cool deserves our attention.